This easy roasted red pepper sauce is a delicious addition to pasta, meat or as a condiment for sandwiches. 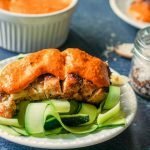 It's also low carb so you can eat it with chicken or zucchini noodles. Very flavorful and only 1.7g net carbs per tablespoon. Chop peppers and mix with garlic, salt, pepper and olive oil. Roast for 30 minutes until nice a tender and a bit of browning. Add vegetables to a high speed blender along with the cream. Blend on high until nice and creamy. Taste and see if you need a bit more salt. I always go a little light so you can add more if you want at this stage. If you wish to have a thinner sauce, add a bit more cream, water or broth.